I loved this book. I don’t often feel like I do right now when I finish a book – right now I just wish it wasn’t over. It isn’t anything special it was just addicting and truly electrifying to read. It follows story of Sheba Hart – a new teacher to a London comprehensive school – told through the eyes of Barbara Covett. It essentially covers a period of around 6 to 9 months and tells the story of an illicit relationship between Sheba and one of her pupils. It’s told in the form of a diary of sort, well it’s literally “notes on a scandal” as Barbara is recounting events that have happened. My quick notes after reading it were ‘dark and twisty’ and I think that’s a very accurate, overall description. The characters are all quite dark, there’s deception going on at every point and it really, really makes you question what is moral. Morality comes in the form of can a student who actively pursues a teacher shoulder some of the blame? Sheba is a character I actually really liked in many respects. For such a short book, I felt there was a great depth of character provided. Initially, through the eyes of Barbara, she comes across as quite ethereal and almost too perfect. It soon appears that not all is as it seems and to me at least underneath it all she’s actually painfully lonely. Upon receiving attention from a pupil, she seems to just fall in to things – however wrong they are – she seemingly falls in love, or at least a deep, twisted variation of it. It also explores friendship. Barbara and Sheba are an interesting pair together. Barbara can see through Sheba and finds a kindred spirit in her – she is equally as lonely. It really covers the “how far would you go for a friend” element; Barbara knows about the affair and, rather than report it, chooses to trust Sheba to end it. Eventually, she uses the knowledge as a weapon against Sheba in a fit of spitefulness. It has been one of those books that I didn’t want to put down, when I did I picked it right back up again. It was just such a good insight in to the human psyche, it was an exploration in to morality and I really, really loved it. The depth of character and plot that was explored in less than 250 pages is astounding and it’s a novella that really gets you thinking. Was Connolly in the wrong? Most definitely. Sheba, while in a position of authority, was a naive woman who craved affection and while Sheba is technically the responsible party, Connolly took advantage of her. It wasn’t love, of course it wasn’t, but him being under 16, or her pupil, should not diminish that he was in the wrong too. It’s this, I feel, that makes it that bit more astounding as it does make you question morality and what is right from wrong in this situation. The end was interesting. Sheba’s discovery of Barbara’s work and the ultimate fall out and reconciliation. I liked that the ending was left relatively open ended, but I also hated it in the same thought! I like that it’s left to the imagination what Sheba did – whether she did come back or, in fact, whether she was in such a dark place that she took her own life (which is what I feel, personally, happened). The open-endedness I feel was good. Definitely. Truly, I cannot fault this. It’s amazing and I would recommend it to anyone who likes a book that gets you thinking, but wanting a quicker read. 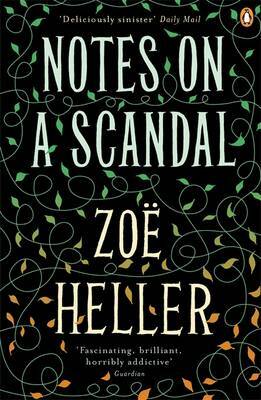 I don’t give out 5 stars easily, but I give it to this and I take my hat off to Zoe Heller too – I’ll definitely be reading more of her writing!